Yet another fun evening at the club. We had fewer club members than usual due to other commitments. We were delighted to welcome four guests and several visiting Toastmasters to our meeting. Rosy opened the meeting with her usual good humour, helping everyone to feel welcome and setting the tone for an entertaining and upbeat meeting. Kevin was the Toastmaster of the evening, with responsibility for guiding us through the planned agenda and helping everyone understand what was going on. As usual, our meeting started with our prepared speakers. These are members of the club that are keen to develop their public speaking skills and have prepared short speeches that they wish to practice. First up was Wendy, who treated us to a speech with the title “Fit your own oxygen mask first”. Wendy used some of her personal experience to explain the impact and importance of stress in the workplace, and gave us all great tips on how to handle it. This was Wendy’s second speech at the club and in this speech she demonstrated what she has learned about how to structure a speech effectively. Wendy is able to see good progress in her speaking and we’re certainly looking forward to the next one! Rosy spoke to us about a person she admires. She shared with us the personal story of this individual, who was born in Ireland and moved to the UK. It was an informative and though-provoking speech, with a twist at the end that intrigued all of us. Graeme was next up with a competition-style speech. This was a little unusual for our club – but Graeme delivered it with great style and confidence. He talked to us about “the fight between the ears”, and the importance of not giving up. He illustrated it beautifully with stories about teaching his daughter to swim, and his personal experience of company telephones. It was certainly entertaining and inspiring. Each of our prepared speakers receives feedback and advice from another member of the club in the form of an evaluation. Arnold, John and Steve were our evaluators, and each provided supportive and encouraging feedback based on the personal objectives of the speaker and their level of experience. These evaluations are at the heart of what makes the club special – as this is how we best learn how to develop our speaking skills. We also practice impromptu or off-the-cuff speaking at our club meetings. This session was led by John, who gave us an opportunity to speak on a topic for just one to two minutes. We ended up with quite an eclectic range of topics, including small minute steaks, the whole problem of foxes digging holes and contemplating stationery whilst stuck in traffic. Throughout the meeting we had Luke paying attention to any distracting “filler words”, Steve listening out for good uses of language and Dorothea helping ensure we all kept to time. At the end of the evening Graeme provided us all with a summary of what we had achieved, and the club members decided on our award winners for the evening. 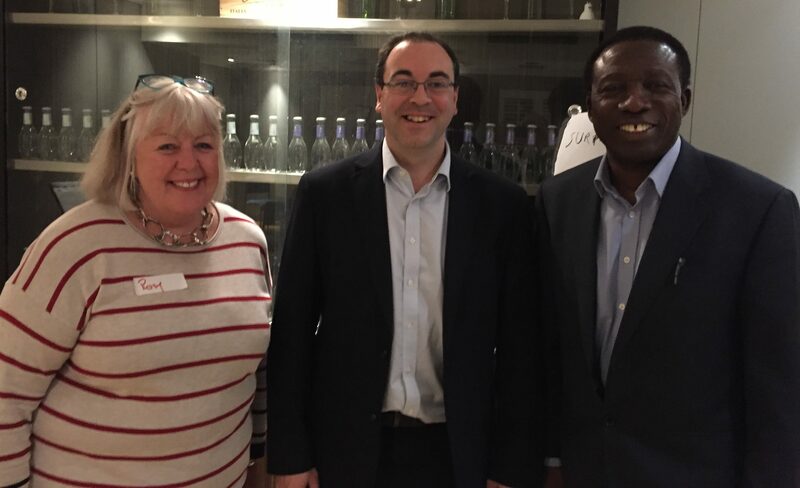 8 May 2017 award winners – Rosy Holt (best Evaluator), Graeme Bass (best speaker) and Arnold John-Mensah (best impromptu speaker). At the start of the meeting Steve set everyone the challenge of using the word “Surprise” when presenting. It was used very well indeed, but the fact that it was a fun and entertaining evening was not a surprise at all. That’s what we expect from the Winchmore Hill club!